Life Tastes Good » 2010 » July - A diary of food and wine from the perspective of a passionate cook who is inspired by the colors and flavors of the changing seasons. So, what do you get when you combine efforts with your brother and sister in law for a LAST MINUTE evening of grilling? Try it, because when I did, I experienced the BEST MEAL of the SUMMER thus far! It was 10am on a random Saturday, and we decided on a last minute dinner at Jigna and Piyush’s place. I can’t take much credit for what I’m about to describe, as what was supposed to be a “simple” meal (said Jigna) turned into such a grande affaire! I had a couple pork tenderloins in the fridge and marinated them in a savory “herb-y” marinade that was balanced with a splash of sherry vinegar, a drizzle of honey, and just enough soy for the umami effect. I still had some sour cherries that I froze after my trip to the market a few weeks ago, so with sous chef Maya’s help, made a sour cherry gastrique. The pork marinade was reduced into a sauce with loads of depth which accompanied the grilled protein, but a dollop of the gastrique reminded us of summer’s bounty and brought balance to the main course. That was my contribution. We started the evening with an elegant and lovely rendition of Summer Bruschetta. Perfectly diced tomatoes, a chiffonade of basil, and a smidge of garlic (with the additions of balsamic and olive oil) topped grilled pieces of baguette and satisfied everyone’s craving for a hearty appetizer. 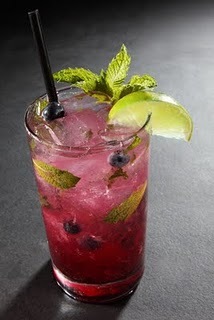 A very balanced and seasonal blueberry mojito accompanied the appetizers – fresh blueberries, ginger simple syrup, fresh squeezed lime juice, and RUM… YUM. One was enough for me though. As I have experienced in the past, if I want to enjoy a cocktail, consume but only ONE! Next was the salad… We harvested some greens from the garden just moments before assembling the salad. Fresh, gourmet lettuces created the bed for this course. This was topped with grilled peppers, grilled red onions, and Italian sausage slices. 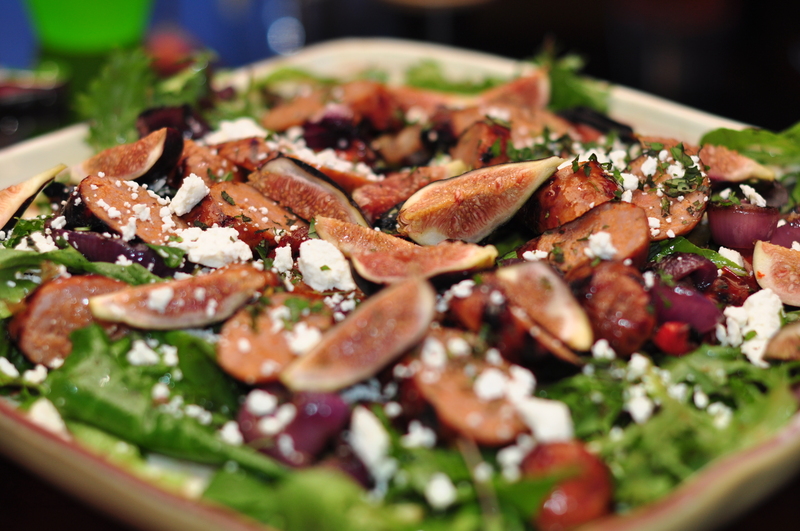 Atop this was slices of fresh figs and sprinkled goat cheese. This was probably the most savory and flavorful salad I have EVER consumed. The best part? Leftovers go well on a pizza the next day. YUM. 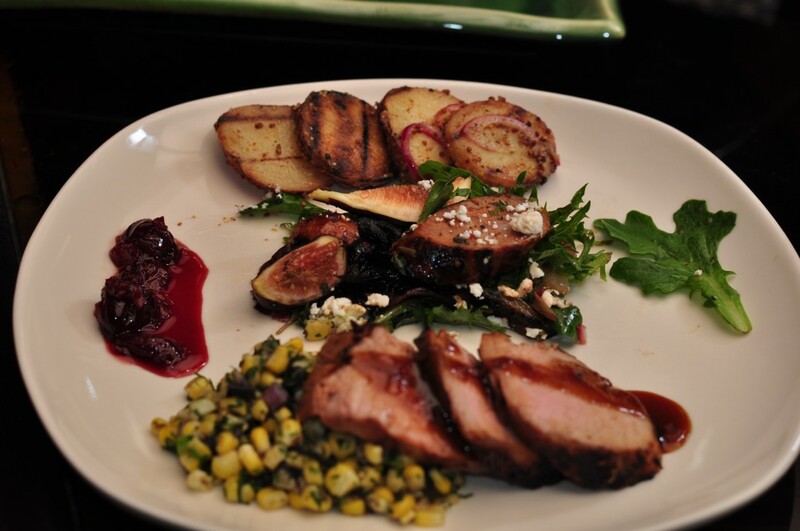 The pork tenderloin was the entree but the sides were the stars at this dinner party! Succulently sweet corn, cut off the cob, with literally “tons of herbs” folded in. Basil, parsley, and dill were amongst the many that were showcased. A unique take on potato salad was served – grilled red bliss potatoes with red onions, capers, and whole grain mustard. SOOO savory, and such a perfect match to the complimentary flavors of the pork and the corn. The entire meal was something out of a magazine; which is why I had to blog about it today! Berries and Cherries and Stone Fruit…. Oh My! Yes, one of the many rewards to braving the summer heat is sinking your teeth into one of these delectable fruit gems…. 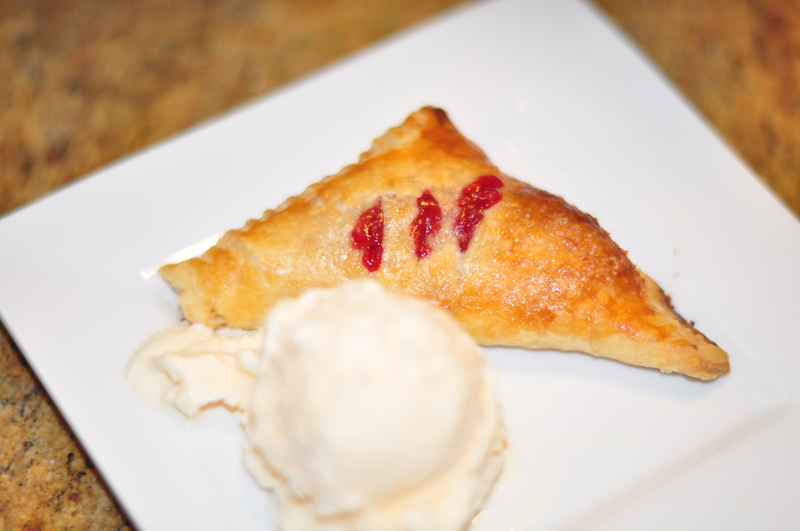 bare and simple; baked into a treat; or incorporated into a delicious sauce of both savory and sweet dimensions. Two of my favorites…. the sour cherry and the blueberry. 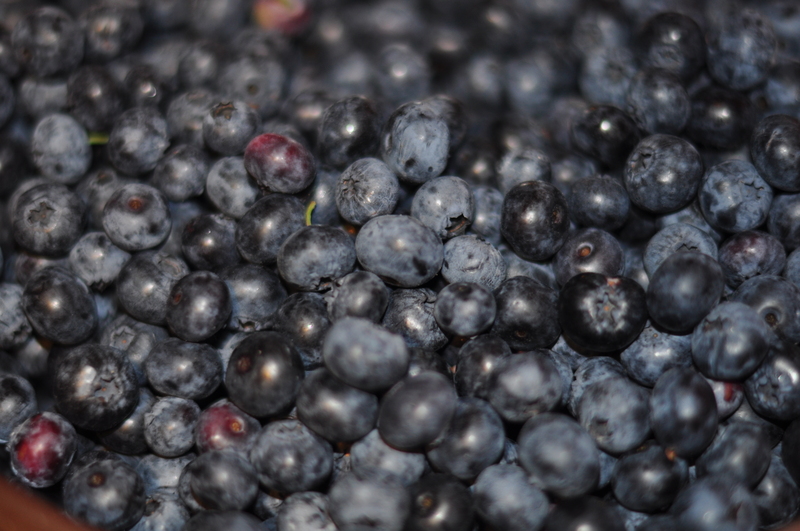 Blueberries from Hillview Farm in Meyersville, NJ. Just up the road from me! Sour cherry season is short lived. Very short. Mid June through early July, and many of the farm markets sell out of their stash (at least the ones that I frequent!) 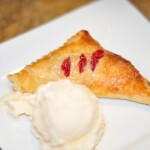 To my friends out there that laugh at me for trapsing into the city on a random early weekday morning to secure my lot of sour cherries… take one bite of this tart or turnover and see why I am so passionate about it! 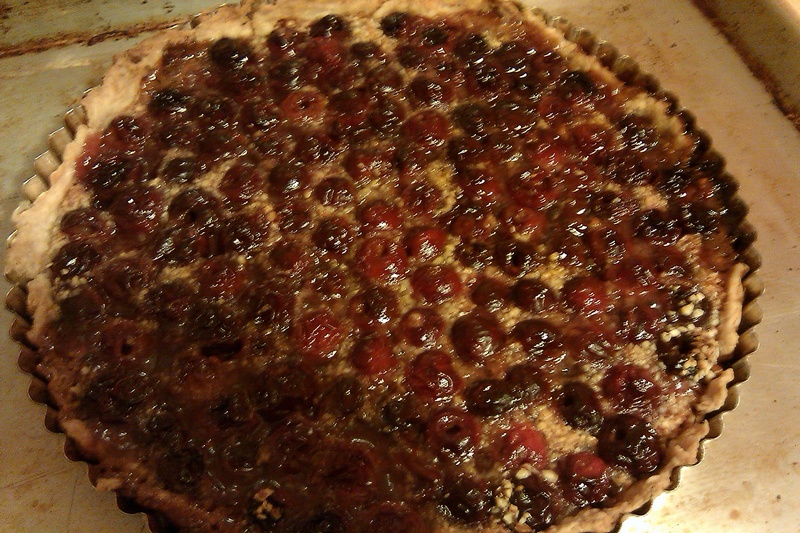 (Oh and forgive the lame shot of the sour cherry tart as that was me taking the picture at 10pm on Sunday night on my cell phone. Manish wanted make sure I mentioned that! I went blueberry picking with some friends and my daughters over at the Hillview Farm here in Meyersville. It was the perfect morning, weather wise, and most of the blueberries were ripe, juice, and ready to be plucked. 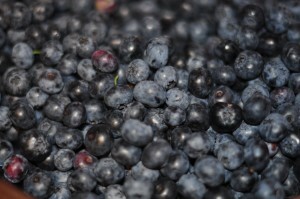 We left with 7 lbs of blueberries, all deliciously plump and sweet. 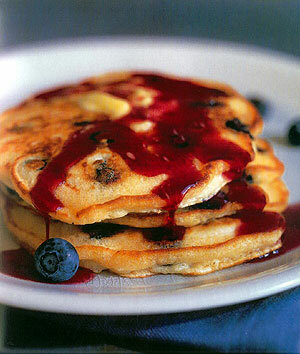 Three days of blueberry pancakes, muffins, and jam, and we still wanted more! Combine first 3 ingredients together in a medium bowl. Mix in butter pieces with fingertips until incorporated (it’s ok if you see clumps of butter.) Stir in ice water with a fork until just combined (dough will be shaggy.) Empty contents of bowl (in other words, the shaggy dough) into a large piece of plastic wrap. Form the dough into a disc and wrap tightly. Refrigerate for 1 hour. Flour a piece of parchment paper and place dough disc on top. Place another piece of floured parchemnet on top (flour part touching the dough.) Roll dough out into a 12 to 13 inch diameter circle. Transfer dough carefully to a 10 inch tart pan. I found this pate brisee very delicate, so if it breaks, no worries – just “seal” any holes with the scraps of dough. Form dough into tart pan and up the sides. “Roll off” any excess dough with the rolling pin. Refrigerate for one hour. 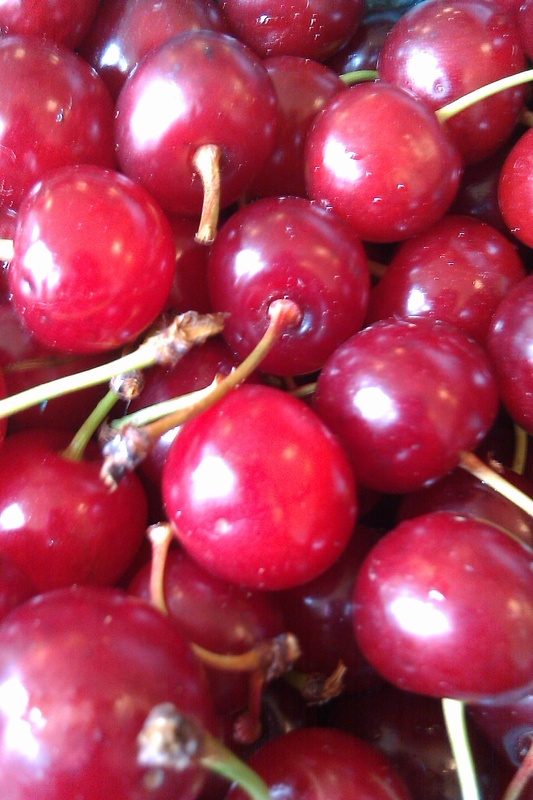 Meanwhile, in a bowl, combine the sour cherries, sugar, and almond extract in a bowl. Grind the almonds and 1 tablespoon sugar in a food processor until fine. Sprinkle almond mixture into the tart shell, and pour the cherry mixture on top. Bake in a 400 degree oven for 45 minutes to an hour. Serve warm. 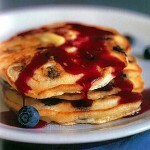 You are currently browsing the Life Tastes Good blog archives for July, 2010.